Chimney sweeps are a traditional accompaniment to a wedding and are said to bring good luck, fertility and fortune to the bride and groom. The tradition of a chimney sweep bringing the bride and groom luck on their wedding day is one that goes back many years to the reign of King George II. The story goes that as King George II was travelling in his carriage the horse attached to the carriage suddenly became wild and frenzied. The only person brave enough to take action and stop the horse from bolting with the carriage containing King George on it was a local chimney sweep who courageously stepped in and saved the day. King George was so grateful to the chimney sweep for saving his life that he issued a Royal Decree that all chimney sweeps were to be regarded as bearers of good luck and that chimney sweeps were to be treated with the greatest of respect. From that day forth the tradition of chimney sweeps being regarded as omens of good luck was established and this is why many couples make the choice to hire a chimney sweep to attend their wedding day. What does a chimney sweep do on the Wedding Day? On your wedding day I will arrive in traditional Victorian Style chimney sweep costume, including the customary chimney sweeps brush, top hat, coat with tails and soot blackened face. I will allow plenty of time for the bride and groom and also any guests who wish to have a photo opportunity with me. In order to bestow the Chimney Sweeps good luck I will have a handshake for the groom and a good luck kiss for the bride. With the power given by the Royal Decree of King George II I will then recite a message of good luck for the future to the bride and groom. I will then present the bride and groom with a personalized certificate and a special gift. 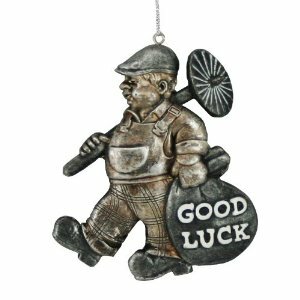 In order to ensure good luck make sure to hire a genuine chimney sweep.